Real Faces Behind Corporate Reform? Look Closer. A few days ago, I read this February 28, 2019, Forbes article entitled, “The Real Faces Behind the ‘Corporate Reform’ of America’s Public Schools,” by Emily Langhorne, policy analyst for the Reinventing America’s Schools project at The Progressive Policy Institute. This statement is absurd: California has never had many for-profit charters, and the legislature banned them entirely last year. Nationwide, less than 15% of the roughly 7,000 charters are run by for-profit operators. That error right there kills Langhorne’s piece: One can siphon public education funding into for-profit company coffers via nonprofit entities, including charter schools. One need not have a for-profit charter school to do so. Still, having that for-profit behind the scenes certainly can be just as greedy and devious. Aside from the graft potential, there is also the general business model of charterization: Make a profit (enrollment, funding, test scores…) or go out of business. In the case of the privatization model, this is what destabilizes communities via charter churn. But I am getting ahead of myself. First things first. Ruhle (R): Steve, this is such an important story. If anyone claims they care about income and equality, economic mobility, it starts with education. If we do not get kids a great education, how can we expect them to succeed? I want to share some videos we saw over the weekend because these teachers are preparing for the strike, quite a few took to social media and explained their reasons for striking. Watch this: Meggan Akins, a kindergarten teacher, she has taught in L.A. for over 20 years. Over the weekend, she posted this video covering all the supplies that she– right there, they’re covered up with white cloth. These are all the supplies that she had to purchase with her own money out of her pocket. Look at it. It’s pretty much most of the things in the classroom. She tells viewers that the strike is not something that she wants to do, but it’s something she has to do. Joining me now to weigh in on the strike, Lily Eskelsen Garcia. She is the president of the National Education Association, the nation’s largest union, that represents 3 million educators across the country. Walk us through this. You are going to be there alongside these teachers today. How did teachers even get to that point? I look at that video: The majority of things inside the classroom, that teacher had to pay for herself to do her basic job. When I show up to work in the morning, I don’t have to deliver the cameras, the pens, and the papers. It’s what they provide for me. And I have the benefit of, well, I’ll leave it there. Walk us through this. EG: In. One. Classroom. With that one teacher. So, when someone says, like this administration, “You know, let’s just talk about your salary,” this is so much bigger than being paid a fair salary. Certainly, that’s something that these teachers and support staff deserve, but they are putting this all on the line because they love someone else’s kid. Because they want those school nurses. They care about class size. They want a librarian. That’s like finding a unicorn in this district. And so, they are putting it all out there, saying, “We want to be in school. We want to be with our kids. We want to be doing the work we love, but we have said, “Enough is enough.” This administration has ignored the voices of the people who know the names of their kids. And who are they listening to? They’re listening to the Betsy DeVos types, the billionaires that say, “I don’t know anything about public schools. Why don’t we just turn it into a for-profit business?” The charter industry has been growing in this district, and everywhere that the charter industry has grown, it’s grown at the expense of your neighborhood public schools. That’s what this is all about. When someone says, “There’s no money,” why isn’t there money? And a big reason is that they’ve given it away to for-profit companies. R: But haven’t many charter schools started because of the terrible situation in public schools? If I lived in a district where there was 45 kids in a classroom, and, to your point, finding a librarian is like finding a unicorn, I’d be desperate for another option. EG: So think about this: If you’re in the charter industry, what do you want to do? You want to create horrible public schools, joyless places that people will want to escape. R: You mean to say, hold on, please, that all charter school founders are there to drain public schools? Come on, now. EG: This is a, so, let’s be very, very clear: The billionaires who are behind this, the venture capitalists, the Wall Street guys, are out to make money on public school. They can find [R: So you mean, sorry, sorry.] there’s a vast, there’s a vast difference in quality with charter schools, and some of them are fabulous, wonderful places, and some of them are scams. The issue is, when did we stop talking about making sure that every public school was as good as our best public school? When did we stop talking about making sure that every kid had what they needed in their neighborhood public school? It’s one thing to talk about a choice, but what if the only choice that these kids are never given is the choice to have a great, to-die-for public school in their neighborhood? And that is by intention. It’s exactly like Betsy DeVos did in Michigan, and they did it in the poorest neighborhoods. They experimented with our most vulnerable children. EG: Yeah, you could. And so, we’re not buying this, “There’s no money out there.” The could be doing so much more, and it’s why I want to come back to that: Are they intentionally starving public schools because they don’t want them to be places that people feel good about? And here’s what is actually going on here with these very courageous, brave educators who are going to be out on picket lines today: When you’ve given up working with negotiations because you feel that the administration on the other side is not engaged in good-faith bargaining, you take it to the streets. You take it to the public. When we saw that Red for Ed wave starting in West Virginia, Oklahoma, Arizona last year, they took it to the streets, and the public then started to pay attention to what had been happening for years in their public school. It was invisible. It was quiet. And then they made some noise, and they got something better for those kids. That’s what we have to hope is going to happen here: That parents and the public will stand beside us. R: We’ve got to find a way to give a good, if not a great, education to every American child. All right. Thank you so much for joining me today. 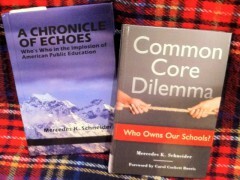 So, back to my previous comment about privatization of public education and charter churn. The business model behind corporate ed reform is one of profit (enrollment, funding, test scores…) or go out of business. In exchange for increased autonomy, charters are held accountable through performance contracts with authorizers, who close or replace them if their students aren’t learning enough. Langhorne is okay with closing or replacing schools. In fact, according to the DC Public Charter School Board, between 1998 and 2019, DC has closed 62 charter schools, with another 3 slated to close in 2020. Now, Arkansas billionaires Alice and Jim Walton, who try to buy elections explicitly to promote charter schools, like they did to the tune of $1.8M in Massachusetts in September 2016, those are some real faces behind corporate reform. Back to Langhorne’s three DC charter school CEOs. They opened their schools in 2011, 2013, and 2018. In 2011, DC closed five charter schools: three for academic reasons, one for financial reasons, and one for low enrollment. Charter churn: part of the corporate reform business model. 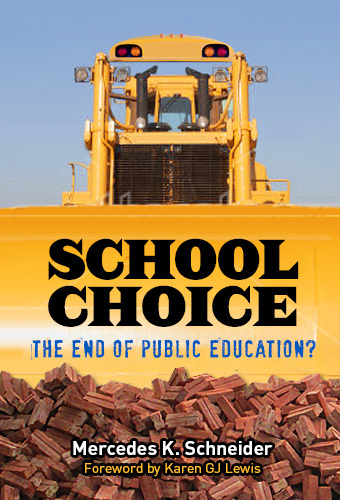 In 2013, DC closed another five charter schools, all for academic reasons. More churn; just business. And in 2018, DC closed three charter schools: one for academic reasons, one for financial reasons, and one for financial, academic, and management difficulties. Since 1996, for every five charter schools DC has opened, it has closed two. It’s just how the charter business works. Maybe that is why after more than 20 years of charter schools making it big on the scene in the mid-1990s, people like NBC’s Ruhle still distinguish between charter schools and public schools, as she did in her January 2019 interview with Eskelsen Garcia. Public schools are neighborhood schools, a place where the business model doesn’t belong. And maybe that is why 20-plus years later, charter proponents like Langehorne must keep sloganing the public, “To clarify, charter schools are public schools,” which is what she had to do in her Forbes article. Hill Harper, “Ivy League actor” has a foundation, Manifest Your Destiny. In 2018, J. Delano Ford was added to the Board. J.Delano Ford is a Broad resident, Executive Director of the Atlanta area TFA and, Executive in Residence at the Charter School Growth Fund (Broomfield, Colorado). He was also linked to the recovery school district in N.O. Dr. Keith Benson’s, “To the Black Education Reform Establishment: Be Real with Who You Are and Who’s Interest You Represent”, linked at the Ravitch blog on Feb. 16, 2019, is a must-read for staff at MYD and the various charter school funds. Prof. Hernandez (Fordham University) wrote at CNN about the difference between “authentic Blackness” and “strategic Blackness”. Strategically advancing one’s career in service to colonialist exploiters, while his/her community is harmed, is a very low thing to do. After J. Delano Ford’s time with TFA ended, he became associated with the Charter School Growth Fund. KEY understanding: “Since 1996, for every five charter schools DC has opened, it has closed two. It’s just how the charter business works.” Interesting how this fact alone doesn’t force the game into a more public light. The fact that charters are referred to as “public”, a PR gimmick of the billionaire boys club and, media don’t call them out on it, is unconscionable. If a military contractor referred to itself as public, media would expose the deceit. The Ohio Supreme Court ruled charters aren’t public and 80% of Michigan’s charters are for-profit. Indicating how bad Louisiana’s state board of education is, at its site under the tab, “E-mail Support Contact List”, the charter support heading states, “Charter Salesforce Platform”. Selling students and taxpayers …what a travesty.